"Didn't get to plan your trip very well, did ya farm boy?" Following in the tradition of great singers turned actors, Willie Nelson threw his hat in the Hollywood ring in 1979. Wisely taking a supporting role as Robert Redford's manager in The Electric Horseman, thespian skills came as naturally to the Abbott, Texas native as a chorus of Whiskey River. Nelson's next role was even better: A starring turn in 1980's spirited semi-musical/love triangle Honeysuckle Rose, a film that so echoed his real life "the road's my middle name" existence, some argued it wasn't a stretch at all to play an extension of himself. Ever savvy, Willie's next few film roles were light years away from country troubadour-ism (the dying safecracker mentor to James Caan in Michael Mann's Thief; a prison camp inmate in Coming Out Of The Ice) with the best coming via director Fred Schepisi's anti-hero western Barbarosa. Nelson is the film's namesake, a former Texas Ranger turned ornery old bandit who has attained a Zorro-esque stature in the Southwest. Forced into life as a fugitive following a family tragedy involving his father-in-law, he finds a kindred spirit in Karl Westover (Gary Busey), a well meaning but clumsy farmhand who is also on the run after accidentally killing his brother-in-law. In awe of Barbarosa from the start, he wants to play Sundance to his Cassidy. Regrettably, a bungle on his part causes their first collaboration to go wrong, and the ensuing rantfest is taken advantage of by Angel (Louis Contreras), a Mexican gunfighter. While his accompanying gang members and Karl watch, Angel fells Barbarosa with a single shot... or so he thinks. While digging a grave for his dead mentor, Karl hears some muttering from the ground. Like a cat with nine lives, Barbarosa has survived, whispering to Karl to keep up the charade while he makes a break of it and plots his revenge. Hours later after a post-killing cat nap, Angel awakens to uncomfortable surroundings as his once thought dead nemesis has buried him in the dirt up to his neck. Although it's jazzy nature may turn off traditional western lovers, Barbarosa is a rewarding film experience for those willing to saddle up for an unconventional ride. The Nelson/Busey teaming is one that works extremely well, and it's fascinating to see the latter's gradual transformation into a near-mirror image of the movie's namesake. Excellent location cinematography and the excellent, mainly ethnic supporting cast creates a feeling of authenticity that only adds to its effectiveness. Image Transfer Review: Okay, let me roll up my sleeves for a rant, here. If this pan & scan afflicted product had come out in DVD's infancy, the sins of a company just getting its feet wet would have been forgivable. But we're in 2003, amigos! No excuse whatsoever for a 2:35 film (even a cult piece like this) to have its artistic integrity compromised. And here's the best part: the opening and closing credits are letterboxed! What gives? As for the picture we're saddled with, it appears Artisan utilized a pre-existing video master that wasn't anything to write home about. The film suffers from wildly inconsistent fleshtones, poor sharpness and detail, and excessive grain; Australian cinematographer Ian Baker must wait until another day for his atmospheric visuals to be restored to their proper Panavision glory. Audio Transfer Review: Artisan's packaging lists a Dolby Stereo Surround mix. Uh-huh. To these ears, the resulting mix sounds suspiciously like Dolby Digital MONO (either that, or it's the narrowest stereo I've ever heard). Not a bad track, but significant distortion during the action scenes and the muffled dialogue at times keep it in the fair to middling column. Extras Review: Extras? Schmextras! Unless you count the enclosed chapter list. 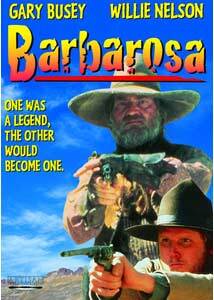 Barbarosa serves up one of Willie Nelson's finest performances, with the always entertaining Gary Busey offering stellar support. Unfortunately, Artisan's less than pristine presentation will leave you crankier than the film's namesake.